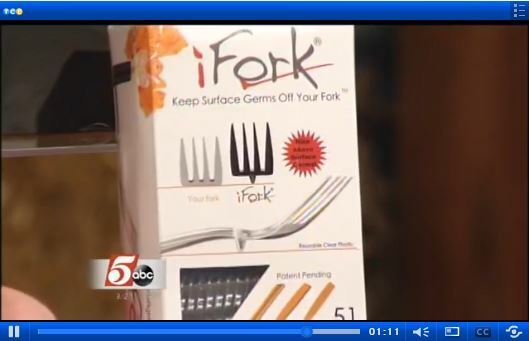 Congratulations to our Client iFork for their feature on Twin Cities Live. The intelligently designed iFork line of flatware reinvents dining by keeping surface germs off your fork, knife, spoon and spork and also keeps food from touching your surfaces.Â The iFork is made with a special rivet (the company calls it an â€œiPointâ€) on the back that acts as a little shelf that hoists the tines, bowl, or blade of the utensil above the table and keeps food from hitting the table. “Tabletops are a breeding ground for germs, but the intelligently designed iFork line of flatware keeps your flatware from resting on these surface germs. Make no mistake, The iFork is truly revolutionary.” ~ Sekuleo Gathers, M.D. Check them out atÂ iFork.com.